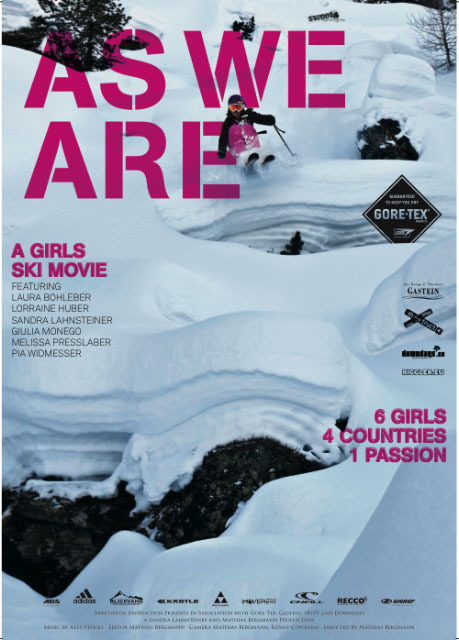 Last year we filmed our very own girls ski movie, “AS WE ARE”, which is currently touring around Europe. „AS WE ARE“ is a celebration of women’s skiing in a male-dominated world of sports where female athletes are notably absent in most ski movies. The 48 minute full-HD film is more than just great ski action in the backcountry. It tells the story of six freeride girls who started their journey as strangers and end up becoming fast friends, a journey which takes them to the best snow and backcountry terrain in the Alps. Click here for all information, our trailer, and upcoming tour dates. You might have noticed that women are rarely featured in ski movies. So a year ago, five of my friends and I decided to make our own all-girls ski movie, and we’re proud to present you the trailer of “As We Are”. 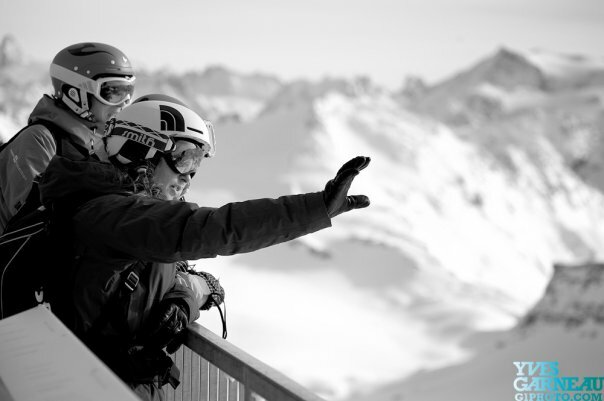 We traveled, skied, planned and lived together last season, visiting each of our home ski areas. The result is beautiful action footage in some of Europe’s best ski areas, and an inspiring tale of a group of girls having fun in the mountains. Get out there girls and go for it! In an interview I once said that one of the things I still want to do is become involved in an all-girls ski movie. This season my chance has finally come! Sandy Lahnsteiner – fitness traininer, mental coach, ex-racer and a woman of action – contacted me in July about the chance to be one of 6 skiers in an all-girls ski movie. The story revolves around a road trip the girls undertake, each to their own home ski resorts. We will travel from Gastein, Austria, to St. Jakob (Eastern Tirol), Cortina (Italy), Lech am Arlberg (Austria), Oberstdorf (Germany) and finally Verbier (Switzerland). As well as some beautiful skiing action, the film looks at how the girls find inspiration from each other to ski the best lines possible. Our goal is to inspire as many people – foremost women, but also men – to grab a group of friends and head to the mountains for some fun skiing action! Riders: Sandra Lahnsteiner (Gastein), Mel Presslaber (St. Jakob), Giulia Monego (Cortina), Lorraine Huber (Lech am Arlberg), Pia Widmesser (Oberstdorf), and Laura Bohleber (Verbier). Camera: Mathias Bergmann from sweetshots, some of Europe’s best outdoor sports photographers. Join our fan page on facebook to follow us on our road trip. For more information about how to get involved in our all-girls film project, please contact me directly.